During the latter part of 1889 the people of the Northern Flinders Ranges were convinced that they had finally struck the jackpot when gold was discovered at Mount Ogilvie, about six kilometres from Tower Gap on Mount Lyndhurst station. On 2 August 1889 Corporal Richards from the Beltana Police Station visited the goldfield at Nichol's Nob and was shown around by Mr Ogilvie, the original discoverer. In his subsequent report to his superiors in Port Augusta, Corporal Richards was able to state that he had seen the gold which was "distinctly visible with the naked eye". He also reported that thirty-four claims had been pegged and that he was told that machinery from the Prince Alfred mine would be brought up to work the gold. 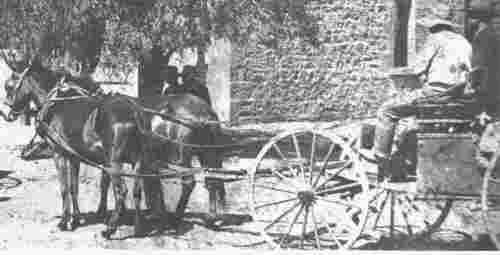 The hire of horses and traps to visit the Mount Ogilvie Goldfield was made possible by A. Poole from the Leigh's Creek Hotel at Copley. A mini-gold rush soon developed when it became known that nuggets of five and seven ounces were found at the Golden Hole. The size of the rush was only limited by the hot weather and the sheer isolation of the place. By the end of the year there was enough business for some parliamentarians to request the Minister for a regular mail service to Nichol's Nob. They already had offers from R.E. McDonald and J.Napier to provide such a service twice a week. The minister did not believe in acting on the spur of the moment and informed them that he would wait and see what happened. As early as 17 December 1889 the Mount Ogilvie Mining Company N.L. was formed. It was to buy leases no. 17,996-18,003 near Nichol's Nob, and start mining with a capital of $60,000. According to Christian Ludwig Meyer, twenty thousand shares had already been subscribed for at the date of formation of the company, which had its office at 68 Grenfell Street Adelaide. As was usually the case another company, the Mount Ogilvie West took up leases adjoining the original mine and before long had two shafts sunk. One shaft reached a depth of twelve metres and the other nearly twenty-one metres. On a trip to the north in October 1890 the Inspector of Mines visited Mount Ogilvie but found the nearby workings of the Nickel Mining Company much more interesting. This company had just raised four tons from a vein only two metres below the surface. His interest was understandable as the price of nickel on the world market was about two and a half times that of copper. The country about Nichol's Nob was later reported to be rich in nickel ore. Nine years later an Adelaide newspaper, when referring to Mount Ogilvie, wrote about its "melancholy remains". Apparently only some chimneys were still standing, with only occasionally a prospector visiting the site but rarely finding anything even looking like gold. Between 1914 and 1918 Nichol's Nob was worked by the Fels brothers who had been able to receive a government subsidy to help them succeed. They found very little gold.